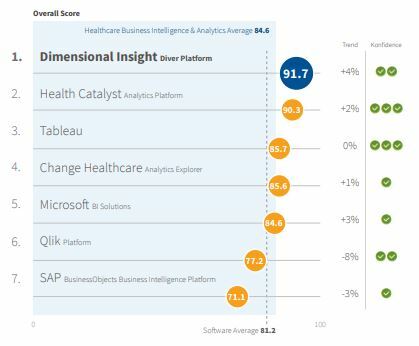 The “2019 Best in KLAS: Software and Services” report came out today, and I’m incredibly excited to share that Dimensional Insight was ranked the #1 vendor in Healthcare Business Intelligence and Analytics. This is the sixth year that we have achieved this honor. 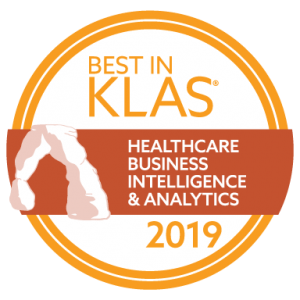 While I would like to extend a hearty “thank you” to our customers who helped us achieve Best in KLAS again, I’d also like to say “congratulations” to them, for this honor is much more about their success and improved outcomes as a result of analytics. In order to obtain vendor scores for the Best in KLAS report, KLAS Research interviews healthcare organizations about their use of technology. It’s a pretty extensive process in which customers are asked questions about the strength of the technology, the outcomes they’ve achieved, and the relationship they have with their technology vendor. How does the vendor take care of you? Do you have a good relationship with the vendor’s staff and executives? What is the quality of training and implementation? What is the culture of the vendor organization? And how does that translate to the service it provides? Does the vendor keep its promises? Are you getting true value out of the relationship? The high marks we have received in the Best in KLAS report indicate that we are excelling in these areas and our customers are not just buying analytics technology, but they are investing in our people and expertise. In addition to the Best in KLAS report, every year, KLAS produces reports on each market segment. In the Healthcare Business Intelligence 2018 report, Dimensional Insight received the highest marks as a cross-industry vendor in whether the product meets customer needs and whether it drives tangible outcomes. Similar to what I discussed earlier, the important takeaway from the report, as well as our #1 Best in KLAS ranking, is that our customers don’t just purchase an analytics solution that goes largely unused in their organizations. Our Diver Platform not only meets the needs and addresses the challenges that they are trying to solve, but it also helps them achieve real, tangible outcomes. In healthcare, that is the ultimate goal and one that drives our company. Finally, I join our CEO, Fred Powers, and the rest of the Dimensional Insight staff in extending a sincere thank you to our customers, not only for helping us to achieve Best in KLAS status, but also for being so enjoyable to work with. Our success is only possible because of your success. And we are expecting even greater success for all of us in the year ahead! Kathy is director of healthcare marketing at Dimensional Insight. She also manages media relations as well as the company blog. Kathy graduated from Dartmouth College and is currently pursuing her MBA in health sector management at Boston University.